Get the most out of your avionics with a Qref checklist. This quick-reference card helps you master the Garmin G1000 quickly. It features common actions, helpful tips, and an indestructible format. Can't remember a function? Want to learn something new? Tired of lugging around a thick manual? The GPS experts at Qref have put together this thoughtful, full-color, double-sided design to get you unstuck. Qref cards are the perfect companion to your GPS system. If you are already familiar with your GPS, a Qref card will provide quick reminders of how to do common tasks. In today's increasingly complex electronics, a Qref card can mean the difference between frustration and efficient operation. The cards are double sided and printed in full color and hard laminated with a military-spec, sturdy 10mil matte finish. This proprietary finish makes Qref cards easy to read, without glare, while protecting the card from UV fading. The bottom line? Your checklist is completely waterproof, indestructible, and will last for years. The 5" x 8" (13mm x 20mm) size is perfect to fit on a kneeboard or slip into your bag or side pocket for easy reference. Review: Easy to use, fits in knee board, able to move around to easily find the information needed. Review: Whenever confronted with a situation where I thought: "What buttons to I have to push to do that? 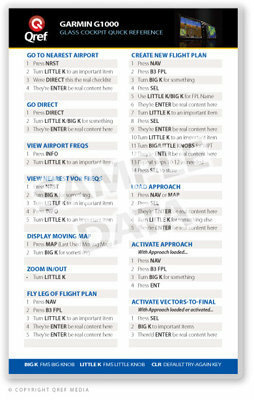 ", this handy reference card was there like having my CSIP with me in the plane to spell out for me exactly what buttons to push and in what order to get the result I needed. Review: Don't buy some huge 300 page book or a computer software program to learn the G-1000. All you're ever going to need is right here on this card. Follow the steps and watch the box work it's magic. Cons: Watch out......people get sticky fingers for these guides !